Lucifer Rising repress now available! 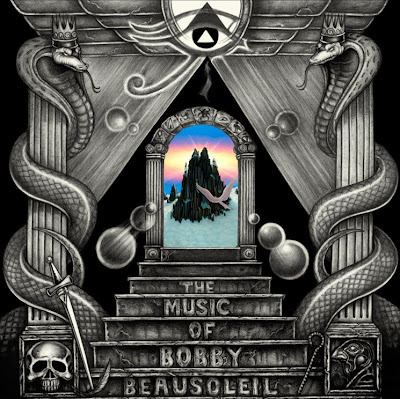 The Ajna Offensive is proud to announce the 2010 repress of The Lucifer Rising Suite! The first pressing sold out in three weeks so ORDER NOW or forever hold your piece. 2am at the Heavy Metal Vomit Party. I'm not sure if I'm banging my head here or falling asleep. Photo by DJ Amy who, it turns out, also took that photo of me at the Amebix gig. Thanks, Amy! In Disgust- new, unreleased and apparently unnamed track! True Story of The Illegal Guardians! 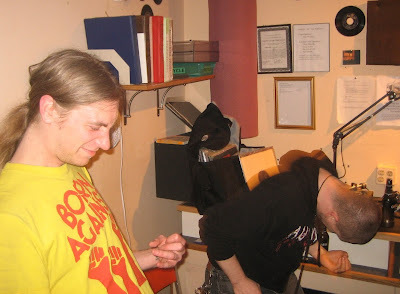 Punc Rok Man by Kallisti, 2004. Your next tattoo? Way back "in the day" when my son was a mere 10 years old- and still shorter than me- he and two of his adult pals formed a primitive musical trio called The Illegal Guardians. They practiced once a week and before long they had cranked out a respectable collection of songs that eventually became the very limited 4th official release on the Mississippi Records label. 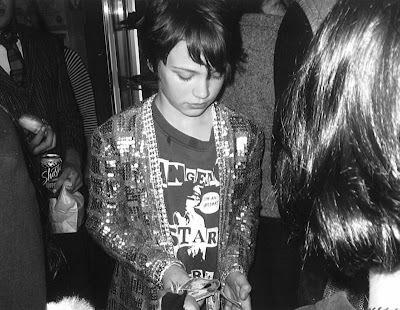 The demo contained such eternal ballads as Burritos, Keep Your Hands Off, The Magic Is In The Hole (a recitation of the entire Voodoo Doughnuts menu), and even a Ramones cover. 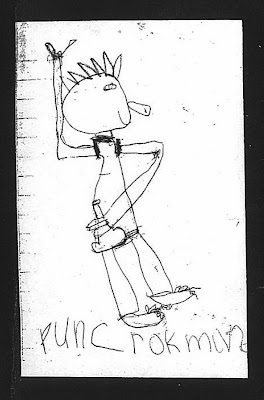 My daughter, 7 years old at the time, provided the cover art with her minimalist masterpiece titled 'Punc Rok Man'. She couldn't spell yet but she astutely rendered the inevitable mohican with hard cider and the demo sold out faster than you could say, "She draws better than her dad." The band went on to play shows with Tragedy, Dog Soldier, This Bike Is A Pipebomb and Stockyard Stoics before our pre-pubescent upstart slowly drifted toward pursuits beyond the decadent spoils of rock 'n' roll super-stardom. All great things must come to an end (until the reunion tour). So there you have it. The authorized history of The Illegal Guardians. And the last mention of my private life on this blog for another 4 years. Happy Valentine's Day. 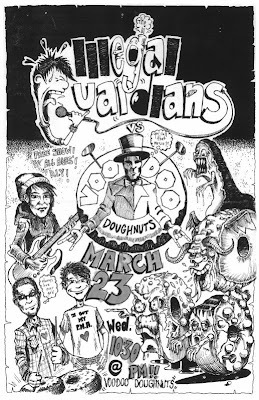 Flyer for the legendary Voodoo Doughnuts gig circa 2004! I'm guest DJ'ing on Portland's only ALL METAL radio show this Wednesday night! Do you like Heavy Metal? 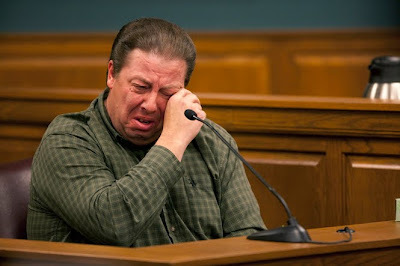 Vomit? 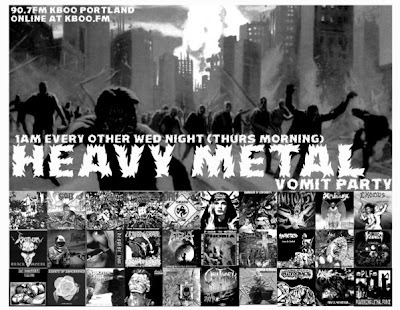 Join me this Wednesday from 1am until 3am on KBOO RADIO 90.7fm for HEAVY METAL VOMIT PARTY! That's right. 1am until 3am. Like you have anything to wake up early for on Thursday. The wagons have been circled and the trinity is complete.